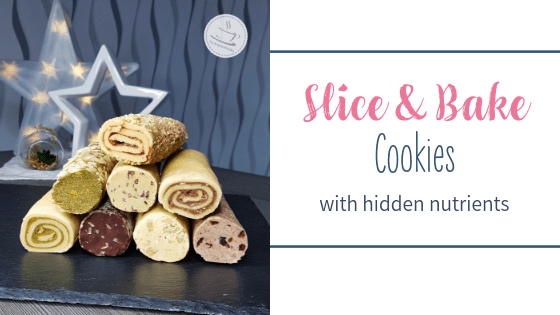 If you’re looking for homemade slice & bake cookies, you’ll want to give these a shot. Not only are they a crumbly soft delight with your afternoon coffee, they are also versatile and contain hidden extra nutrients. I’ll show you how to do this! Until a few years ago my husband was our designated cookies and cake baker, bread magician, and dinner chef… I hardly found the effort required for cooking and baking to be in proportion to the finished product. When I became a mom, more kitchen tasks were inevitable so the search for shortcuts was on. The more shortcuts I found, the more I started enjoying the process of baking as much as eating the results. 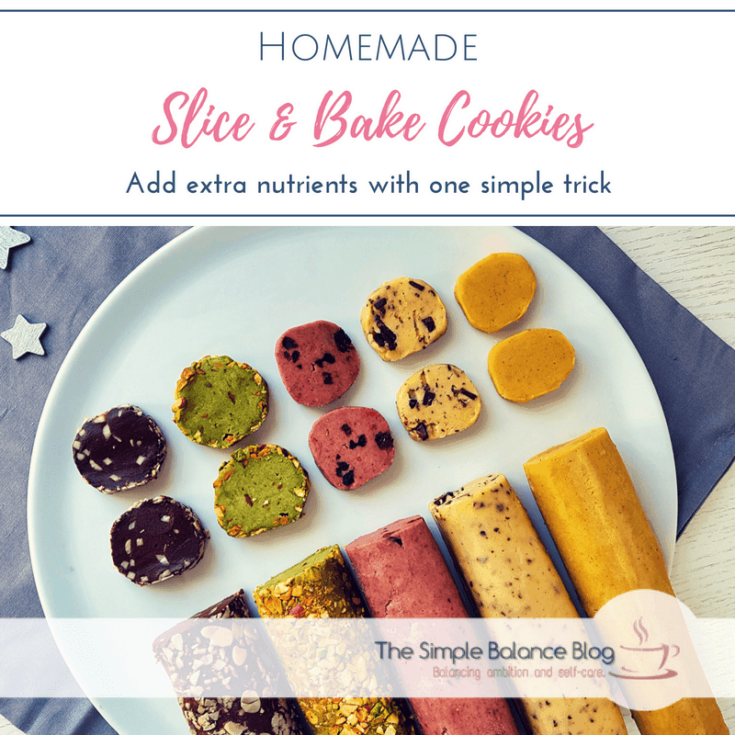 In this article, I will show you a simple recipe for delicious slice and bake cookies that uses unexpected ingredients to up both nutrient content and flavor. And pssst… these are great to prep for Christmas several months ahead! I started experimenting with homemade slice and bake cookies for rather pragmatic reasons. I wanted to find a way how I can ease the stress of Christmas time. Cookie baking is something I really want to do with my kids during that time of year but at the same time, I have very little patience for the ensuing mess. So more often than not it wouldn’t happen because, in the middle of everything that was going on, I simply couldn’t stomach the sticky chaos it would turn my kitchen into. So the idea was to find cookie dough recipes that freeze well and thus would allow me to prepare several different kinds of cookies way ahead in October. During Christmas time, all I need to do is thaw the dough and bake the cookies. 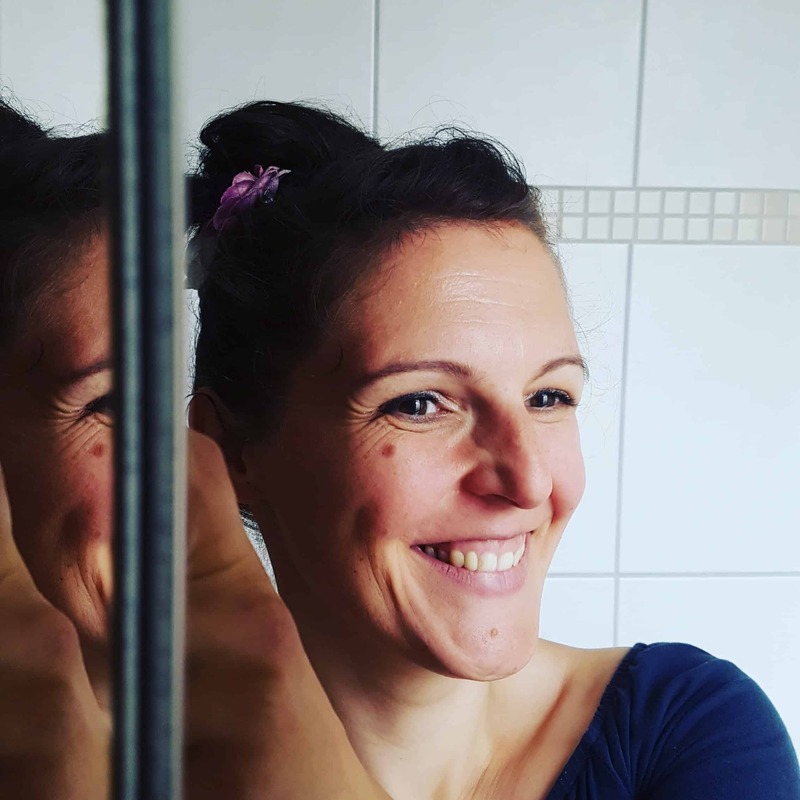 Since the most time-consuming part in baking – assembling ingredients and preparing the dough – is already done, I might even have some energy for cookie decoration with three little people! With a little more bite than sand cookies, these delicious cookies melt on your tongue. With just a handful of real food ingredients, they are quickly assembled and come with a ton of variations. Even better, you can achieve gorgeous flavor and color by using an unusual ingredient that happens to majorly up the nutrient profile of the finished product: Smoothie powders. You know the freeze-dried fruit powders that come in all colors and allow you to add rather unpalatable vegetables to your morning smoothie almost unnoticed? They work great in this recipe! I used ground up freeze-dried berries for the red cookie log and brought the pistachio-flavored dough to a bright green using a smoothie powder with ground kale, wheatgrass, matcha and the likes. Do you have a kid who prefers pasta and rice plain “with nothing” and refuses to eat one-pot meals because it’s all mixed together? This kind of offspring is unlikely to be impressed with any of the delicious cookie flavors I included in the recipe below. Instead, you’re gonna wanna make an all plain version, but add a little yellow smoothie powder to it for an extra burst of nutrients. Preparing the dough is pretty straightforward. Add the ingredients for the basic dough to the bowl of your food processor or Kitchen Aid-like machine as described in the recipe and choose your flavor-giving add-ons. Working quickly, turn the dough onto a piece of cling-film and roll into a log before wrapping it in cling-film. If you find it difficult to make a somewhat perfect roll, use the cardboard inside a roll of kitchen paper, cut lengthwise. Put the dough on a piece of cling film and roughly shape into a log. Now put the cardboard around the dough and smoothen it while rolling it in there. At this point, you get to chose whether you want to bake cookies right away or enjoy the fruit of your labor during a busy season like Christmas. After 30-60 minutes in the fridge, they are ready to bake. 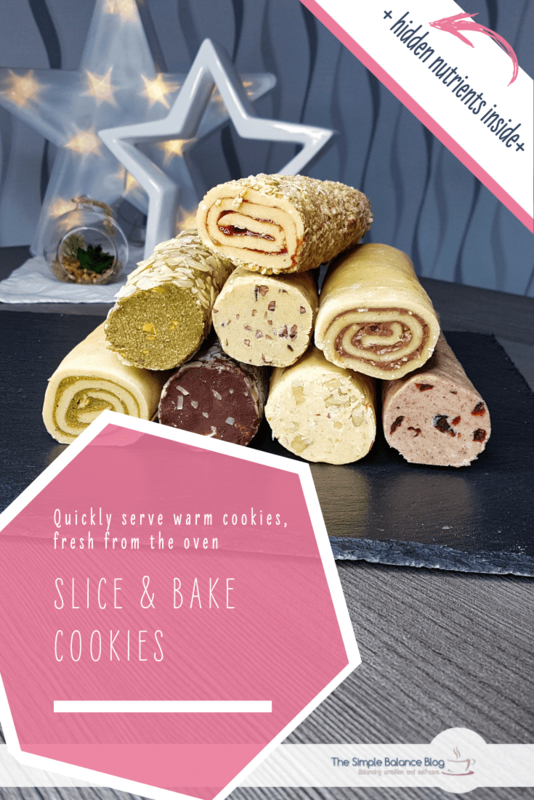 To store for later, place your cookie dough logs on a baking tray while freezing and later move them to a resealable freezer bag. To make the process of baking even easier later, write baking instructions like temperature and time on the freezer bag. To bake, cut any number of cookies as thick slices (approx. 0.5 cm or 1/4 inch) straight from the frozen log and place them on the baking tray. If you manage to plan ahead better than I do, you can defrost the rolls overnight in the refrigerator and bake cookies over the course of the next three days. In the recipe, I give you variations that I have tried and loved: Cranberry-Orange, Almond-Pistachio, Chocolate-Gingerbread, Hazelnut-Mocaccino, Red berries and Chocolate-Almond. Our absolute favorites are the Chocolate-Gingerbread cookies at Christmas time. During the rest of the year, the red berry biscuits are a huge hit with my family. For an even prettier look, coat the dough logs with chopped nuts or sprinkles from the outside. And finally, there is always the option of dipping one part of the baked cookies in melted chocolate or icing and decorating them with sprinkles. If you prefer the slice and bake cookies even firmer, double the amount and still use only one egg yolk. First of all, if you go an entire Christmas season without baking cookies with your kids – they will be fine! If you are so low on energy that you cannot possibly add one more thing to your to-do list, skip it. Your kids benefit much more from having you around in a somewhat sane state than from making Christmas cookie baking memories with a mom who’s falling apart. #1 Make several flavors of the same recipe. To do so, double or quadruple the base dough, then halved or quarter it (about 300 g or 10 oz is a single batch) and add different flavors to each batch. This works well if you only need to fold in coarse ingredients such as pistachios or cranberries. Folding in smoothy powders can create a nicely marbled effect but should only be done with a pleasant flavor like berry powder. #2 Produce the same dough several times in succession. Measure 4x flour, weigh 4x sugar, separate 4 eggs, and so on. Everything is prepared and ready to go quickly. This works best if you want to add spices and smoothie powders that need to be incorporated evenly. #3 Pick out several recipes for Christmas cookies that have similar basic ingredients and require resting time in the fridge. Quickly prepare the different kinds of cookie dough and, instead of resting in the fridge, freeze them for Christmas time. I’ll show you in more detail how you can prep different cookie recipes for Christmas months ahead in my next article. #4 When baking cookies anyway, double the recipe and freeze half of the dough. 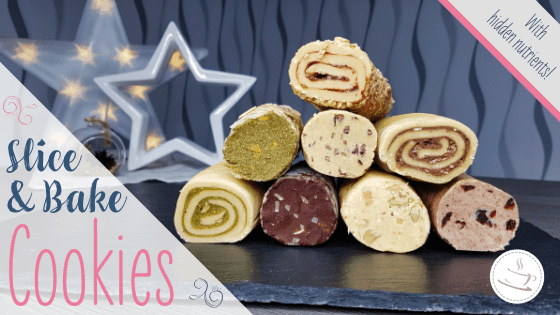 I’m pretty confident, if your current season of life allows you to, you won’t wait until Christmas time to give these hidden nutrient cookies a go! So grab your ingredients and start creating your own amazing flavor combinations. And be sure to let me know which one was the winner in your house! One basic dough, many variations - and you can prepare everything weeks in advance! The recipe can also easily be doubled or quadrupled. Put flour, icing sugar, vanilla and salt in a mixing bowl or a food processor and mix coarsely. Add the butter in small pieces and work in with a hand mixer or the knife insert of the food processor so that the mixture looks like moist sand. Add the egg yolk and mix briefly until the dough shows coarse pieces. Now add the optional ingredients depending on the variant and mix briefly. 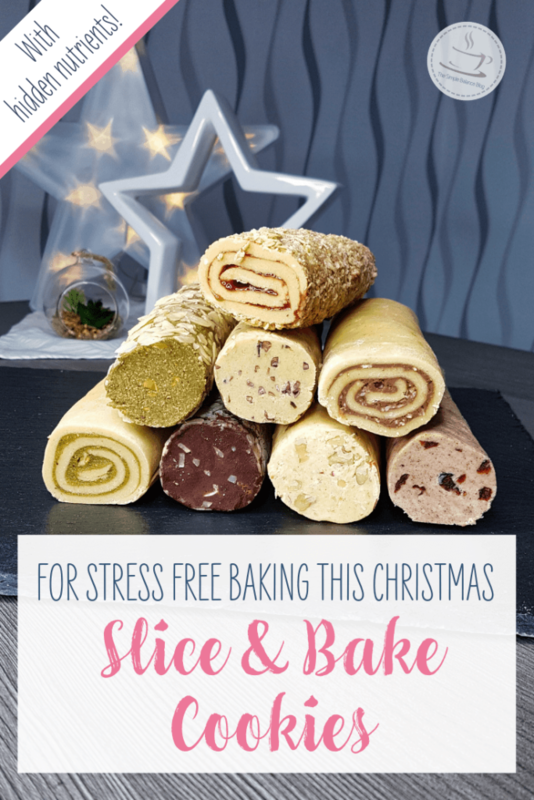 Spread the dough on a long piece of cling film and form a thick roll (possibly with the help of the cardboard inside a roll of kitchen towel). Close the transparent film at both ends of the dough roll by twisting it. Place the dough in the fridge for at least 2 hours (up to 3 days) and bake straight away or freeze afterwards. Vanilla can be added with ground vanilla, bourbon vanilla sugar (1 sachet or 1 teaspoon) or vanilla extract. If you do not want to buy almond extract, you can also use almond flavour (only a few drops). If the biscuits are already a little darker at the edges, they should be carefully placed on a grid immediately, because they still continue to cook on the baking tray / the silicone baking mat otherwise.